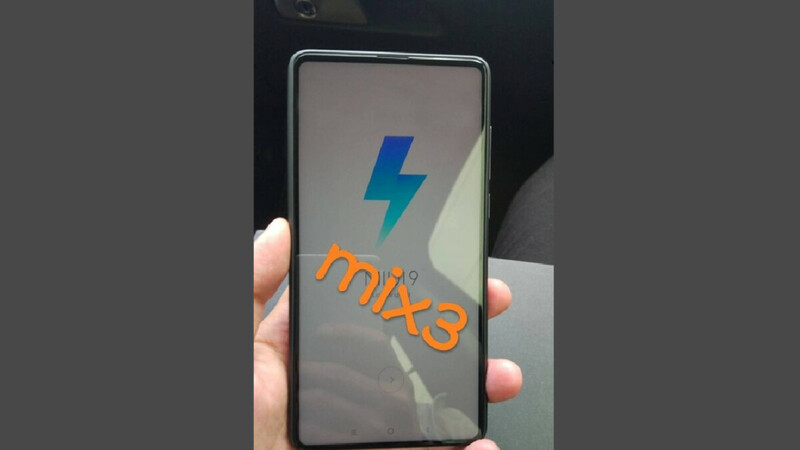 Just last week the first alleged live image of the Mi Mix 3 appeared online, revealing a new design approach from Xiaomi that opted for more uniform bezels, rather than a large chin down below and razor-thin alternatives elsewhere. Today, reconfirming this new look, yet another live image provides an even clearer glimpse at the flagship. Taking an approach that gives the illusion of a much higher screen-to-body ratio, the new smartphone clearly sports pretty thin bezels all the way around. Because of this, though, Xiaomi has been forced to remove the front-facing camera from the panel. Now, the image in question doesn’t confirm the presence of a pop-out module for the sensor, but it's worth pointing out that a recently-leaked teaser for the Mi Mix 3 did include the silhouette of a smartphone that boasted one on top of the frame. Aside from this, an in-ear speaker can be seen towards the top of the smartphone too and, on the side, a volume rocker and a power key are clearly present. Interestingly, the smartphone showcased in the images is running MIUI 9 instead of the newer MIUI 10 software. However, considering the Mi Mix 3 that's pictured is likely a prototype, it wouldn’t be surprising to see the low-cost brand test the product with older software. In any case, though, an update to the newer interface is to be expected ahead of its launch in September. For now, Xiaomi is yet to comment on the existence of the Mi Mix 3 but with the unveiling expected to take place in September, it shouldn’t be too long before more device details leak out. Very nice. It feels like I just bought the Mix2 and now I have to buy this one! That's because it has bigger side and top bezels than the alternatives you are talking about which have super thin side and top bezels. Bigger top and side bezels gives it more uniform look and thus bottom one looks smaller (illusion). While in reality it won't have any smaller bezel than the competition. Wrong. Removing the bottom camera has helped reduce the bottom bezel and created a more symmetrical look. The Mix2 has tiny side bezels and a slightly larger top bezel already. But of course you wouldn't know that since it's unlikely you own one or have ever seen one physically. i prefer this one though. looks so uniform and symmetric. a beaut! Cliche of the day, alluding to the iPhone X. Are you blind ? There is no Android phone in existence with a smaller lower bezel. Yup I hope it has big batteries too and not so expensive.